If any of the infrastructure giants thought NB-IoT might be fertile ground for a cheeky bit of vendor lock-in, Vodafone has pre-empted that with a fresh statement of independence. Almost every vendor on the planet will preach the democratic and glorious benefits of a multi-vendor environment, but deep-down they will hate it. It eats away at profits, reduces the predictability of revenues and erodes guaranteed service profits. For operators it is fantastic, they are in control and have the upper-hand for negotiations, for vendors it’s like bumping into your ex; just smile and deal with it. Since the launch of the commercial NB-IoT service across Spain, Vodafone has been ‘working’ with network partners Huawei, Ericsson, Nokia and Affirmed Networks to test the interoperability of NB-IoT modules from several vendors. In short, Vodafone is trying to make sure it has the ability to take advantage of cheaper devices or software when/if it becomes commercially available as the trend moves towards mass market acceptance. “As a company committed to a multi-vendor strategy, we understand the importance of a healthy device and network ecosystem in delivering the best service to customers at a competitive price,” said Luke Ibbetson, Vodafone’s Head of Research & Development and Technology Strategy. Ultimately it looks like Vodafone is trying to wrestle control of the ecosystem back off the vendors. Creating interoperability allows the buyer be in control, as it should be, but in recent years the operator position in command of the value chain has been tenuous at times. Perhaps this is a sign there is an over-reliance on Huawei, or there might be an over-reliance before too long. 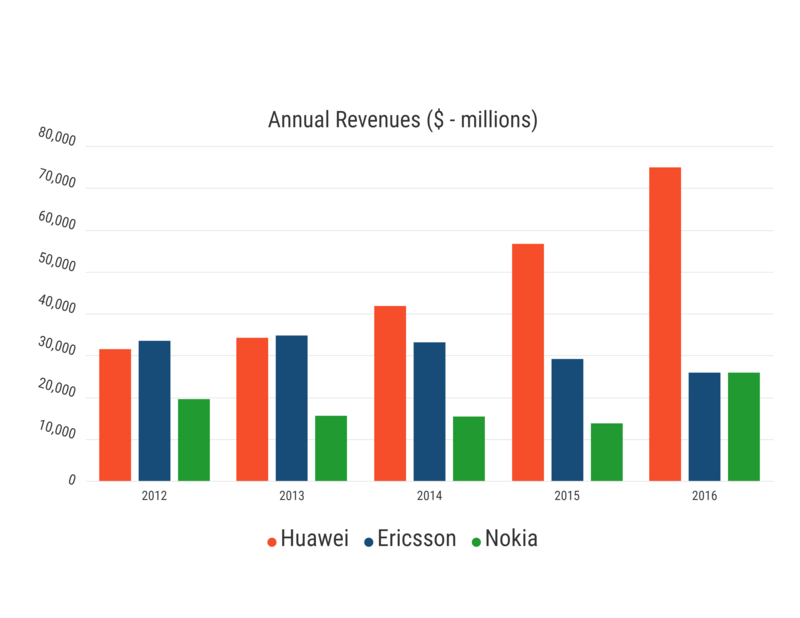 When it comes to performance of the network infrastructure giants, Huawei has been b*tch-slapping the pretenders for years, as the revenue summaries below illustrate. This is not because of competitive pricing, but primarily because it is better, a couple of CTOs told us at MWC this year. However this success could prove to be the catalyst for competitors; how much Huawei technology can you have in your operations? What is the Huawei critical mass? Huawei might be the best around, but they will have to share with the rest. “Since completing the initial roll-out of the first fully standardised commercial NB-IoT network in Spain, Huawei has been working closely with Vodafone and its network partners to verify the interconnection capability between Huawei’s NB-IoT RAN, Vodafone’s strategic IoT core network and all currently available commercial NB-IoT modules,” said Huawei’s Edward Deng, presumably through gritted teeth. “Ericsson and Vodafone are working closely to deliver NB-IoT coverage to Vodafone’s commercial networks. This also involves successful interconnectivity testing of our system with commercial NB-IoT chipsets and multiple device vendors,” said Eric Parsons from Ericsson, perhaps secretly happy it doesn’t have to go head-to-head with Huawei again. Curiously, Nokia didn’t comment on the situation. Perhaps it is still is too much of strop to grin-and-bare it. Preventing a vendor lock-in situation always has been an activity at the top of the agenda for operators throughout the world. Vodafone seem to be getting ahead of the game here, much to the dismay of the vendors.